@BifBangPow: Another New "Venture" for Bif Bang Pow! 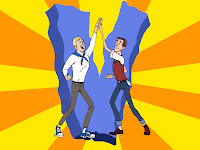 i've been a huge fan since it started, it has all the charm of johnny quest on crack. Yay!!! Fantastic work, Jason! You're the best! Get ready to become RICH, Bif Bang Pow! This line of figures has been on my wish list since seeing my first episode of the show. Brock Samson will be the next Wolverine. "Build a H.E.L.P.E.R." would be good incentive. Though he doesn't look like he'd need many parts, maybe 3.